The fragile state of our economy is affecting homeowners throughout the metropolitan Detroit area. For some, providing heat for their family is a major concern. For three of them, this could be the winter when the furnace is no longer a concern. 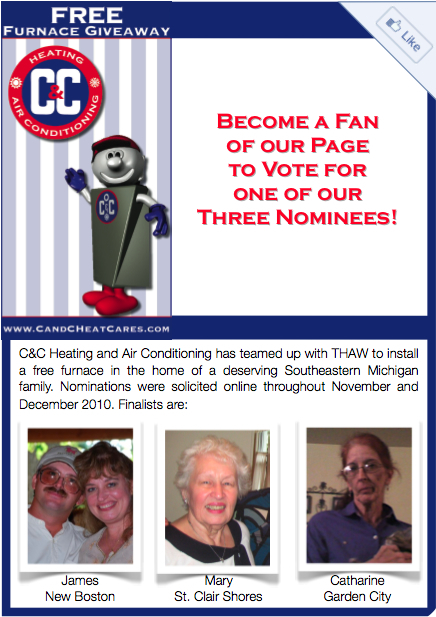 C&C Heating and Air Conditioning has teamed up with THAW to install a free furnace in the home of a deserving Southeastern Michigan family that’s having difficulty coping with a subpar furnace. The Heat And Warmth Fund, THAW, is an independent non-profit (501(c)(3) agency that provides low-income individuals and families with emergency energy assistance and advocates for long-term energy solutions. Nominations were solicited online throughout November and December and three nominees have been identified. They are: James of New Boston, Mary of St. Clair Shores, Catharine of Garden City. James takes great pride in the fact that he has lived in the quaint Township of New Boston all of his life. He considers New Boston to be a special place where old-fashioned values are important and a sense of community still matters. He works for the local Metro Park Authority and was nominated by his wife whom he married live on the radio with ½ million listeners tuned in back in 1998. Together, they have raised five children and recently welcomed a grandchild into the world just over a year ago who also lives with them. Jim has also been the primary caregiver for his mother, who lives next door, caring for her since he was a teenager. Although Jim loves his job working for the local Metro Park Authority, finances are very tight and it’s been difficult to make ends meet. Last year, during the coldest point of winter, the furnace quit working. A repairman told them that it couldn’t be fixed and would need to be replaced. Somehow, Jim was able to cobble together a repair which allows it to run, as long as it remains set no higher than 60 degrees. Having their house heated using space heaters with a baby in the house, Jim and his family pray for a miracle while maintaining a bright and sunny outlook on their lives. Mary was nominated by her daughter for many reasons. “When she was just 49,” she says “my dad died suddenly of a heart attack at the age of 50. Five children still lived at home with my youngest sibling being 12 at the time. She was a stay-at-home mom and suddenly had to work 2 jobs to make ends meet. She has struggled financially her whole life yet somehow managed to get by, pay taxes and work. I honestly don’t know how she did it, however, she’s a really strong woman. At 76, she finally stopped working. She’s living on social security yet finds a way to be generous to her children & grandchildren. My 51-year-old brother who lives with her is disabled with muscular dystrophy and my mother is his care giver.” Her daughter remembers the furnace being installed when she was just a child, probably at least forty years ago. A new furnace would be such a tremendous support to someone who has given so much to so many over the years. Like many Michiganders, Catharine has struggled to find work over the past few years. And so, at age 55, she has enrolled in school to learn a new field. She will graduate with an Associates Degree in Medical Billing and Coding in October 2011 and looks forward to finding a good job in a new field. She was nominated by her daughter, who is proud of her mother for many things, not the least of which is her 3.5 GPA. Her daughter supports both of them by working as a waitress. When the furnace went out last winter, Catharine cleaned houses to save up for the repair. Unfortunately, other expenses including medical expenses for their beloved family dog have mounted and their heating system is still not working. Although they live without any source of heating in their home, their love of family and optimism about the future create a warm and caring environment in which they live. More information about each of the nominees can be found online at www.candcheatcares.com. Voting will be open from January 7-27 with the winner announced during the THAW Radiothon on January 29, 201. To learn more about THAW, visit www.thawfund.org.